The Bates method is a holistic eye care system which uses mental and physical exercises, instead of corrective lenses, to help those with chronic vision problems. It was developed by the American ophthalmologist William Bates (1860-1931). Bates challenged the medical establishment by theorizing that poor eye sight was due to the overuse of eye muscles caused by emotional stress. Emotional extremes, such as rage and grief, will exacerbate already poor eyesight. The longer a person holds on to these conditions, the lesser chance they will have of recovering from the bad eyesight. Bates thought that a person could be taught methods that would help relieve eye muscle tension which would allow the eye to function in a more natural and relaxed way. The Bates method exercises are heavily incorporated into contemporary vision training. William Bates was a famous New York City ophthalmologist when he started to doubt the fundamental principles of the profession. Vision problems were thought to be caused due to hereditary problems or were considered to be part of the aging process and treated with prescription glasses, which did very little to stop, or cure the weakening vision. Bates then engaged in several years of research, the results of which he eventually published in his controversial book, Better Eyesight without Glasses (1920). In this book, Bates argued that the standard treatment was based on false premises since glasses actually hampered any chance for the patient to recover. Bates reasoned that glasses engaged the bad use of eye muscles, which are a caused by psychological tension. The use of glasses almost ensured that the wearers will be doomed to a lifetime of impaired vision. In lieu of glasses, Bates recommended remedial exercises that would help users get away from the use of glasses and therefore, the eye muscles that will hinder any chance of recovery. This thinking was extremely controversial and garnered very little support in any kind of professional circle. Experts believe that the Bates method is a pioneering form of biofeedback and stress reduction training. It should also be noted that Bates is one of the first doctors to recognize the relationship between vision and emotional disturbance. This insight is of important significance to different field s ranging from special education, sports, and art studies. Bates thinks that, “We see very largely with the mind and only partly with the eyes.” With this, Bates thought vision as something that was inherently individual and variable. Furthermore, such things as mood, memory, health, and circumstance played a role in how and what a person will see. 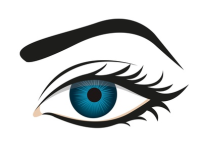 The primary concern in the Bates methods is the functioning of the six muscles that controlled the shape of the eye. Bates thought that these muscles determine the eye’s ability to focus, hence, connect the bridge between mind and vision. Tension that has been built up in any of these eye muscles have the potential to gradually weaken vision, producing such conditions as nearsightedness, farsightedness, astigmatism or a condition known as “lazy eye”. On the other hand, Bates argued that when the tension was released, it would encourage the muscles to regain their innate flexibility and strength, which repair poor vision. Bate’s understanding of vision was influenced on the behavior model of health, which is crucial to the Alexander technique. This technique credits the organism with an ability to heal itself once any hindrance or obstacles to its normal functions and operations are removed. Bates then constructed a set of eye exercises, later known and referred to as the Bates method. He believed that these exercises will help “re educate” the muscles of the eye. One of the most surprising exercises of the Bates method is one that, superficially is a vision test chart, but is really a memory device. By encouraging the memorization of the numbers and letters on the chart, trainees will do two things; they sharper their acuity of vision while concurrently assuming mastery of the source of an anxiety. The majority of the exercises were designed to end the habitual staring Bates noted as the prime symptom of “blocked vision”. In the exercise “shifting”, the trainee will be trained to look “through” object. In “swinging”, the trainee will move their eyes in accordance with a rhythmic side to side swaying of their body. The Bates method treatment is accessible to optometrists that are specialized in vision training. The therapy programs are adjusted to meet each individual’s specific need. The programs are also likely to include new and innovative techniques or modified versions of the traditional Bates exercises. In majority of the cases, the course of therapy takes several months of weekly training sessions. It also takes a devoted and faithful performance of daily exercises at home, school, or work by the participant. The typical training regimen will take up to ten weeks. The participant will learn how to relax, focus their mind and eyes while seeing. The person will rest their eyes by closing them and thinking about something that is agreeable. Alternatively, they can close and cover the eyes with the palms of both hands to exclude any exposure to light. This method is called palming. In order to improve focusing, one method is to hold a pencil in each hand, one at arm’s length, and the other 6 inches. First, focus will be on one pencil, then the other. The Bates method is credited with vast, dramatic improvement in the vision of many people that have been wearing corrective lenses or contact lenses in order to correct a vision problem. With the Bates method, the participant will learn to relieve a significant pocket of stress, which is thought to enhance the individual’s sense of well being. It can also aid in the speedy recovery from other disorders. The Bates method, with or without any comprehensive professional vision training program, should not be considered as an appropriate treatment for cataracts, glaucoma or other disease of the eye. Anyone with these or other eye related problems is advised to consult a professionally licensed ophthalmologist. Though contemporary vision training has incorporated several new techniques, it is based on Bate’s approach and makes varied use of the exercise that he has devised. Airline pilots and athletes have used this as an important resource to help strengthen their eye-brain coordination.